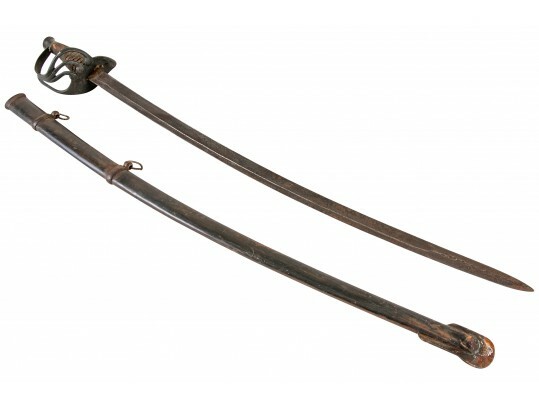 Nashville Plow Works [Nashville, TN] Confederate Officer’s sword, c. 1862, brass hilt with knuckle bow and pierced counter guard with scroll motif, leather and wire-wrapped grip over wood, hilt engraved “Cpt. H.A. IV ALA,” possibly Captain Hesley Armistead who died in the First Battle of Cold Harbor June 27-28, 1862, shoulder of blade marked with manufacturer’s mark on one side and “CS 1862” on the reverse, patinated blade with scattered rust and oxidation, accompanied with an unmarked scabbard, loss to leather grip, blade measures 33 ½” l. x 1 ¼” w. (at base); tip to pommel guard 39” l.; scabbard 35 ½” l.